For the last fourteen years it has been a popular trend in the metal scene to bash any new In Flames release because many closed-minded old-school metal heads are still living in the previous millennium, unable to turn the page and accept that In Flames has been willing to experiment and play a more alternative metal style with a certain mainstream touch. Instead of giving up on the band, these self-declared “true fans” still expect the band to return to a genre it pioneered and improved during the first ten years of its career. I’m completely on In Flames’ side here because it’s useless to keep on reproducing music that the band already played in such a great manner on its debut record Lunar Strain. Instead of becoming an irrelevant copy of its former years, the band has experimented for the majority of its career over the past fourteen years. In Flames continues to do so, and the new album is another big slap in the face of those grown-old nostalgics. And that’s the way it has to be. Enter Siren Charms. This record is as experimental as A Sense Of Purpose…, but less accessible. It continues the style of Sounds Of A Playground Fading with a few electronic and modern alt-rock touches influenced by Soundtrack To Your Escape. The great thing is that the band continues its very own sound without copying any particular record to any extent. This record includes quite a few surprises. The dirty, fast, and misanthropic “Everything’s Gone” could have come straight from a Marilyn Manson record and is definitely one of the best songs here, while the slow and plodding “Through Oblivion” has a modern gothic rock style I would expect from a band like HIM. Once again, if you like this kind of music as much as I do, you are going to thoroughly enjoy this song. The melancholic and floating “With Eyes Wide Open”, with its crystal clear fragile vocals and its catchy chorus, reminds me of Thirty Seconds To Mars. “Dead Eyes” hits a very similar vein and comes around with convincingly beautiful guitar and keyboard melodies that make it an instant standout. In this song, In Flames sings: “This is my world now”, and singer Anders Friden, as well as the whole band, performs with as much conviction as Metallica did on the song “My World” from the controversial St. Anger. Many people are calling Siren Charms In Flames’ personal version of St. Anger because of this. Even though these two records are miles away from each other stylistically, this comparison is not completely wrong. Both bands did what they wanted with passionate authenticity and unbowed power, and didn’t care about being popular or pleasing their fans at the time. That’s why I like both records quite a lot. Some will call the two aforementioned tracks emo rock, but they’re performed with such conviction that it doesn’t bother me in the least. “When The World Explodes” starts like a mixture of a metalcore and a melodic death metal song that could have appeased the old fan base. But In Flames wouldn’t be In Flames if it didn’t include a couple of controversial elements. Just thinking of the looks on the faces of the extreme metal “elite” makes me enjoy this track. Its second part features soft and enchanting female vocals and floating electronic elements. In Flames really shows off its creative song writing capacity in this track. The first single, “Rusted Nail”, has it all. Longing guitar solos, fragile clean vocals (that sound better on each album), depressive lyrics, and an extremely liberating, majestic, and melodic chorus you won’t get out of your mind. This is the kind of song that continues the style of the previous record. Imagine a mixture of the tracks “Sounds Of A Playground Fading” and “Liberation”. This is where In Flames shows its consistency and how its past albums logically build upon each other. Album closer “Filtered Truth” features mechanical vocal effects and opening guitar riffs that make me think of Billy Talent (how cool is that?). The short passionate chorus simply blows me away once again. This consistent song without one unnecessary second is crowned by a melodic but twisted instrumental bridge. The track ends a very good album on a high note. Hello, third single, I like you! 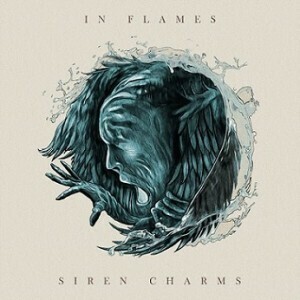 In the beginning, I thought a couple of songs on this album were a little hard to digest or unspectacular at certain moments, such as the short title song “Siren Charms” and “Monsters In The Ballroom”, which recalls several modern melodic death metal songs from the past three In Flames releases. Even these rather average tracks have grown on me after several spins. It’s hard to tell if I like this record as much as Sounds Of A Playground Fading, but my first impressions are pretty much as positive as they were with that album three years earlier. So please don’t give a damn about rude comments on social media or average scores on the Metal Archives. If you liked In Flames’ previous records and don’t mind the experiments described above, you have to purchase this album. By the way, the two bonus tracks “The Chase” and “Become The Sky” are excellent modern melodic death metal songs that should do well with fans that liked A Sense Of Purpose but none of the other recent releases, so be sure to look out for them. Be courageous and check this out. In Flames we trust.